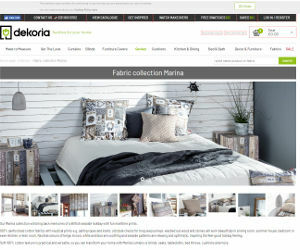 Dekoria is an interest and unique retailer, they offer over 50,00 unique textile products and fabric. The majority of Dekoria’s offering is of a premium quality and comes fully customizable. We really like Dekoria because they try their best to inspire you and make you think different about your living space. Their made to measure is massive, and boasts dozens of unique categories such as Curtains, Blackout Curtains, Roman Blinds and Table Clothes. What type of products do Dekoria sell? They produce quality textile and fabrics for some of the most popular types of furniture, including tables, chairs, bedroom and kitchens.